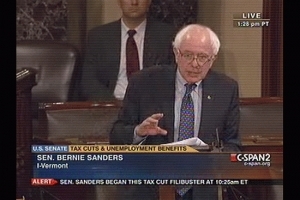 What a remarkable performance today by Senator Sanders of Vermont. He spoke non-stop for 8.5 hours today educating America about the dangers of the current proposal for tax changes. He was particularly concerned about the increase in income disparities this bill will represent. He held the floor not by reading the phone book, but in a manner that made me wish I had on tape to show my Macro students next term.